With the vast amount of text being posted online and via social media these days I thought it would be beneficial to share this very brief tutorial for how (and how not) to style all that great stuff you’re sharing online. These tips apply anywhere you might post text—whether it be in one of our content management systems, WordPress, Facebook, Blogger or even old fashioned MS Word, these simple design principles will help insure your message gets the credibility that it deserves. Learn to use <shift><enter> (Windows) or <shift><return> (Mac) to insert line breaks with no vertical spacing. This practice helps insure you maintain close proximity of related content and greatly aides in readability. People often just hit <enter> between lines of text which adds awkward and undesirable vertical space. Don’t change typefaces (fonts). 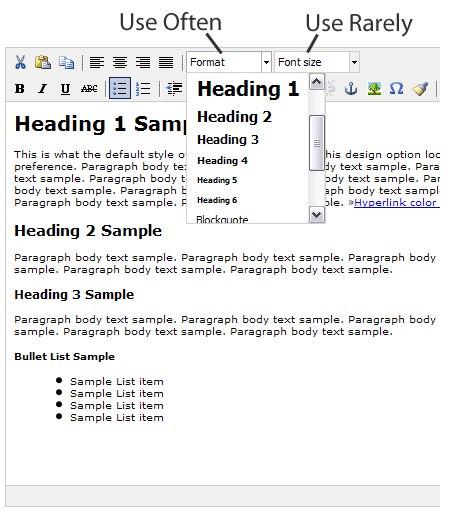 In fact you cannot change fonts/typefaces in our CMS text editor but many other text editors allow you to do so. The typefaces for your Website are specified in a single Style Sheet that was developed specifically for your site and insures consistency across all pages of your Website. Consistency in the presentation of your content is a cornerstone of good design. Don’t change typeface colors. For a professional consistent presentation of your content the colors are controlled through the Style Sheet. Emphasis colors (such as the color of your hyperlinks) have been selected by your professional designer specifically to harmonize with the color palette of your Website. Use the "font size" selector very very sparingly. Avoid at all costs using the "font size" selector to increase text size. This practice will invariably create inconsistent and amateur rendering of your content which cannot be controlled from the central style sheet. The only reason we retain the font size selector is for those rare occasions where a line of text needs to be reduced in size. Avoid using "U" Underline to emphasize inline text. People will think the underlined text is a hyperlink. Rather use the "B" (Bold) or "I" (Italic) icons to emphasize a word or sentence. We are extremely pleased to announce the opening of our second storefront in the beautiful city of San Jose, California. Please join us for our grand opening on April 3rd. Use the "Format" selector to change heading text size and create a logical hierarchy of content. Using this method allows consistent presentation for your site which is controlled by the Style Sheet. Does your company send out hard copy or email newsletters to your customers? If done correctly such can be cost-effective ways to retain clients, increase revenue per client and build equity in your customer evangelists. The inherent benefit to legal and ethical email marketing (i.e. emailing only to subscribers who have opted in and can easily opt out) is the very low cost of publishing and distribution. While response rate numbers can vary based the quality and relevance of your lists and content, on average they’re only 1-2%. As you’re no doubt painfully aware from a personal perspective, the problem with email marketing is its overuse and the fact that it shares a sometimes blurred line with the scourge of the 21st century−spam. Pause for a moment and consider how effective email marketing is when directed to you. Keep in mind I’m not talking about unsolicited emails, but rather emails from those newsletters that at one point you made a conscious decision to subscribe. How many email subscriptions can an individual sign up for before they’re completely inundated with information? Chances are that many people have long ago passed that threshold. I receive many email updates from organizations in which I’m keenly interested, yet rarely do I have the time to devote my undivided attention to read through their contents. Don’t get me wrong, I’m not disputing that email and hard copy newsletters are a proven means of marketing. But there is a better way . . . an easy way to turbo charge your emails so they’re much more effective. What I’m referring to is RSS (Really Simple Syndication), a universal data format that broadcasts the content of your newsletter to the world in a very similar fashion to how a radio or television station broadcasts. With RSS someone can subscribe to your newsletter in the same manner they preset their favorite radio stations in a car or set their favorite TV stations on a remote. The appeal, and the reason for the rapid growth of RSS, is that the end user is in complete control and no unwanted feeds can force themselves onto the user. For example, my default homepage is iGoogle which I’ve loaded up with subscriptions to RSS feeds from organizations and topics of interest. The three most recent headlines are displayed for each feed and they are updated automatically when a particular publisher posts a new article. Most of these RSS broadcasters send out email updates of the same info too, but by broadcasting in RSS they’re picking up a wider audience at no additional cost. RSS provides another important benefit that email does not. Because RSS broadcasts to the world your message is no longer restricted to your closed email subscriber list. Keywords in your newsletter can now be picked up by all the major search engines and thus your newsletter can be found by anyone on the Web. So unlike email or hard copy newsletters RSS is a powerful tool for generating new awareness. The benefits don’t stop there. When you broadcast a newsletter via RSS, typically a new Web page on your site is automatically created. If people find value in what you have to say they can create a backlink to your article. According to Google, backlinks (aka linkbacks) are the single most important factor for search engines in determining the value of your Website. Increased links back to your Website benefit your search engine profile and ultimately increase your Google PageRank and place your site higher on keyword search returns. From our experience, when utilized with quality content, RSS is the most powerful search engine optimization tool available. The good news is that if you currently publish an email newsletter adding RSS broadcasting capability to it is not a difficult or expensive proposition. How it can be integrated into an email campaign will vary, but in many cases it can be no more effort than simply typing the newsletter at a single portal. For example, on the Web 2.0 sites we develop your newsletter can be entered online and published with a click. Immediately a new dedicated page is created for your newsletter, a nicely formatted email automatically sent to your subscribors, and the content of your newsletter is instantly broadcast and indexed by the major search engines. We’re pleased to announce an upgraded version of our Content Management System (CMS). The CMS is the core application software that works in conjuction with a server database to provide all the great Web 2.0 information management and broadcasting capabilities that we’re always talking about. Our Web 2.0 CMS provides the vital tools that help our clients achieve their business goals by increasing the reach and impact of their messaging and decreasing the cost of Website administration. Make blog/news posts that are automatically distributed by email and broadcast via RSS. Automatically link the major search and blog indexes to their blog/news posts to dramatically increase message reach and awareness. New streamlined modern Web 2.0 administrative panel design theme that makes the updating and editing process easy to understand and navigate. A new word-processor page editing interface that provides any user intuitive controls for posting and formatting of text, photos and files. The ability to easily create multiple pages and RSS streams by simply assigning a category to your post. Optimized and formatted RSS feeds. Your RSS feed content is displayed using the same format and styling that you specify on your site page. Easy integrated system to upload images or file from your PC or Mac to post on your Website. Fast performance for both site visitors and administrators. 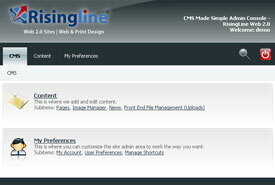 The ability to use a new custom graphic design or to modify an existing design for use on the CMS site. One button system backup and restore. The ability to assign unlimited editors to your site with customized permissions . . . you can assign a user the ability to edit the content on only one page or to have complete administrative control over the site. Full html formatting of content posts for advanced users. But don’t take our word for it, try it out for yourself. Just contact us for access to our sample site. You might also be interested to see our screen shot tutorials. The most important aspect of Web 2.0 is not the technology itself, but rather the new culture of free and open communication that comes about because of technology. The old era of caveat emptor (let the buyer beware) that was supported through biased and untrustworthy advertising is past. Web 2.0 technology has birthed a new era of caveat venditor (let the seller beware) since consumers are now able to communicate freely amongst themselves and provide unbiased feedback on sellers’ claims. Amazon.com is a prime example. How can Web 2.0 help your business? Is your business Web 2.0 compatible? Again, the most vital element to success is not the technology itself, but rather the real value your business presently offers consumers. For those businesses who meet this criteria, Web 2.0 technology is tailor made to effectively assist in achieving the marketing goals mentioned above. Bear with me as I give yet another Web 2.0 analogy. If I buy this 2006 ADR3 race car for $85k, its got the technological capability to win races. However, just because I buy the car does not make me competitive with professional drivers. Assuming I could con my way into entering a professional race, it would soon become apparent, when I crashed and burned on the first corner, that I was an amateur. The technology would do me little good if I did not posses the real ability to utilize its potential. Do your current customers (not you, your employees, or executives) consider the products you offer to be truly unique and superior solutions? Do you receive a significant portion of new business through referrals? Is it easy for your prospects to understand your unique value proposition? Is the leader of your business dedicated to establishing a front facing culture of transparency, honesty and direct communication with customers? Do your employees understand and embrace this vision? This by no means is a comprehensive list, but hopefully you get the idea. The more “yes” answers you can give to these types of questions the more potential your business has for excelling by implementing Web 2.0 technology and tactics. For a more detailed look at how Web 2.0 technology can help you achieve your marketing goals you may want to check out our “Helping you achieve your goals” page.